Removable mouthpiece allows tests to be carried out hygienically. ENVIRORENT has released the Dräger Alcotest 6510 breath-alcohol measuring device. It offers fast reaction times and is energy efficient with one set of AA batteries enabling more than 1500 measurements to be performed. It offers precise measurements, even at high alcohol concentrations while excluding reaction to other substances. The removable mouthpiece allows tests to be carried out hygienically. The Slide 'N Click mouth piece is easy to attach in daylight or at night and can be fitted for either right or left handed operation. A large backlit display with full text prompts makes navigation through menus easy and interpretation of results unambiguous. The mouthpiece design, alcohol-specific sensor and integrated control mechanisms all contribute to the prevention of test result manipulation and deception. Uncooperative subjects who resist the traditional breath test can still be tested through a passive testing technique. 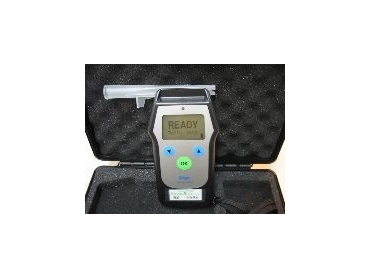 The Alcotest 6510 retains the last 10 results for easy recall.